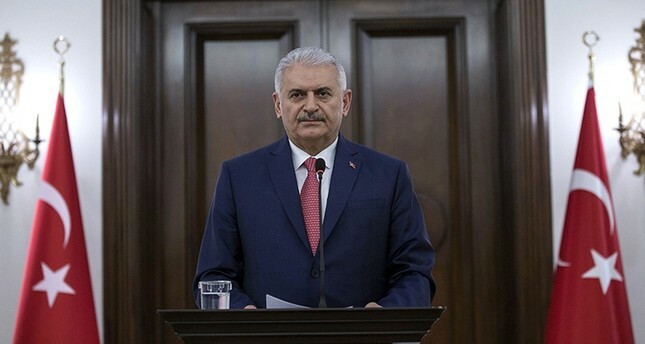 Prime Minister Binali Yıldırım said Wednesday the decision for early presidential and parliamentary elections in Turkey was made after taking into consideration the recent developments in geopolitical and security matters. Speaking in a news conference in Ankara, Yıldırım said the planned snap elections would also make the current situation compatible with the new Turkish constitution. Yıldırım noted that there was a common expectation among Turkish citizens that constitutional changes, made in a 2017 referendum, would be entered into force immediately. "As you know, the parliamentary system has been amended with the popular vote on April 16, 2017, and the presidential system has taken its place in our constitution [...] After adaptation of the constitutional changes some chapters have entered into force immediately and some are expected to enter into force in the first elections [following the referendum]." "Our citizens hope that this change will take effect as soon as possible and that the current situation will become compatible with the constitution," Yıldırım said. Such a decision was made in consideration of the geopolitical developments and security issues that our country faces, he added. Earlier, President Recep Tayyip Erdoğan announced plans to hold early presidential and parliamentary elections on June 24. He said that as the crisis in Syria accelerates, the election issue should be taken off the table. "For this reason […] we decided to hold elections on Sunday, June 24, 2018," Erdoğan said. The announcement came after opposition Nationalist Movement Party (MHP) leader Devlet Bahçeli -- whose party is set to enter the elections in an alliance with the ruling Justice and Development Party (AK Party) -- called for early elections. A bill to that effect was submitted to parliament on Wednesday.